Humulin R U-500 has been a feasible treatment option to improve glycaemic control in individuals with severely insulin-resistant diabetes. It alleviates the volume-related problems associated with high doses of conventional U-100 insulin and may allow fewer daily injections. Humulin R U-500 insulin is drawn from a 20ml vial and administered via an insulin syringe. Given the small number of ADS ADEA 2014 Delegate Handbook, P a g e | 127 The conference acknowledges the sponsorship of patients on Humulin R U-500, there is a significant risk of overdosage of insulin in the hospital setting, if staff administering the insulin are unaware of the increased potency of this insulin. Considering the highlighted safety risks, an intervention was undertaken in attempt to minimise error. To identify the number of Humulin R U-500 administration errors in a tertiary hospital setting and to develop safety procedures and educational resources to ensure safe management of patients using Humulin R U-500. A retrospective audit of medication errors in administration of Humulin R U-500 was undertaken. The intervention consisted of the development and implementation of patient alert cards; patient id alert bracelet/necklaces and educational resources for both patients and staff. Staff have demonstrated increased awareness of the difference between Humulin R U-500 and Humulin R U-100 insulin and confidence in administering prescribed insulin. 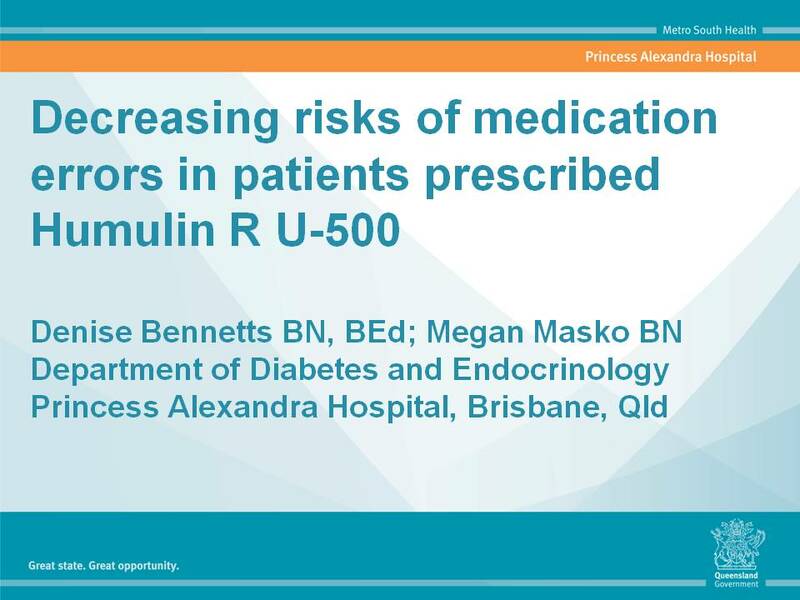 Clinicians and patients need to be aware of safety issues associated with Humulin R U-500 administration. Steps and processes have been implemented to avoid the risk of medication errors to enhance patient safety.